​Ingersoll: Follow the main street out of town heading north. This road is the 31st line. You will cross Dundas (Highway 2), keep going straight. Follow the road until it turns gravel. Keep going down the gravel about half a concession. You will see our sign at our driveway. Turn left down our driveway. You have Arrived! ​Woodstock: Take Dundas (Highway 2) west out of town towards Thamesford. Turn right onto the 31st Line. Follow the road until it turns gravel. Keep going down the gravel about half a concession. You will see our sign at our driveway. Turn left down our driveway. You have Arrived! ​Thamesford or London: Take Dundas (Highway 2) East out of town towards Woodstock. Turn left onto the 31st Line. Follow the road until it turns gravel. Keep going down the gravel about half a concession. You will see our sign at our driveway. Turn left down our driveway. You have Arrived! ​Stratford: Take Highway 7 out of Stratford. Turn left onto the Embro Road. Take the Embro road all the way to Brooksdale. At Brooksdale turn right onto Rd.92. Go down road 92 until the 31st line (at that corner will be the big wooden signs for Happy Hills). Turn Right down the 31st line (you will be turning onto gravel). Keep going down the gravel about half a concession. You will see our sign at our driveway. Turn left down our driveway. You have Arrived! ​All of these facilities allow us to do many different activities throughout a fun filled week at Camp Tanner. May 16th 6:30-8pm July 2nd 5pm-7pm July 3rd 6pm-8pm None of these work for me, can I book another time. 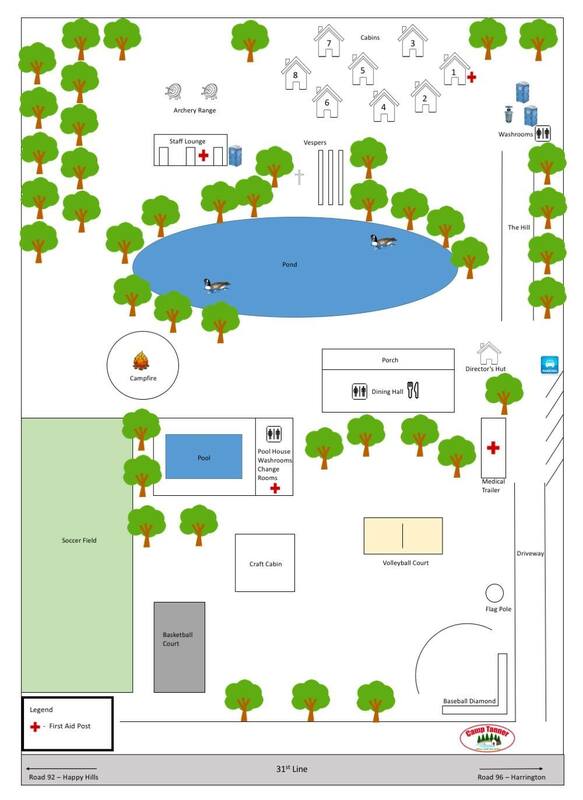 This is a map of our facilities. You can use this to find your way when you arrive. Generally you will want to make your way to the Dinning hall as this is where we sign in and out.